The world was warned. And yet the fight has just begun. Never before has a man's rise to power posed such a threat to the survival of humankind. Donald Trump's ascendancy to the Presidency of the United States shocked the world. Climate advocates are especially stunned to see a climate change denier now at the helm of a country with such a huge influence on global climate policy. While the rest of the world is finally moving forward, Trump is determined to bring the United States in the opposite direction. 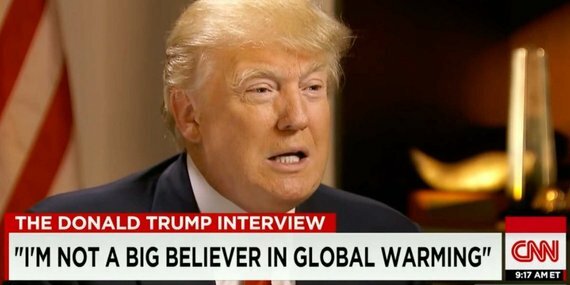 To describe Trump's views on climate change as misguided and insulting is an understatement. His tweet in 2012 that his view on climate change as "created by and for the Chinese in order to make U.S. manufacturing non-competitive" is an insult to millions of people worldwide that are losing their homes and, in some cases their entire country, to rising sea levels. It is an affront to the victims of some of the most extreme droughts and storms on record. It is an ominous warning to the world that he and his allies only care about the economic well-being of a small group of people at the expense of current and future generations. Amidst the criticism he receives, Trump does recognize the importance of protecting the environment. In an interview with ScienceDebate last year, he wants to focus on providing clean water, increasing food production, preventing the spread of epidemics, and developing new energy sources. However, he refused to acknowledge the impact of increasing greenhouse gas emissions on solving the aforementioned issues, claiming that "there is still much that needs to be investigated in the field of 'climate change'". While there is still a lot of research to be done regarding the extent of the impacts of climate change, the fact that Trump refuses to even commit funding for this endeavour suggests that he has no intention of ever listening to millions of voices both in the United States and other countries calling for immediate climate-related action. His decision to revive the stalled construction of the Keystone XL and Dakota Access oil pipelines amid eased environmental review processes threatens nearby land and water resources and the safety of Native Americans in these areas. He also claims that the United States should have kept the oil of Iraq due to its military efforts in the Middle East and may even launch an attempt in the future, risking even more bloodshed in an already politically unstable region. "If we kept the oil you probably wouldn't have ISIS because that's where they made their money in the first place. So we should have kept the oil. But OK. Maybe you'll have another chance. But the fact is, should have kept the oil," Trump said in a report by the Alaskan Dispatch News. In contrast to his political allies who have admitted that greenhouse gases do have an effect, Trump has embarked on a campaign to purge all the scientific data within his jurisdiction. Various government agencies such as the US Environmental Protection Agency and the National Oceanic and Atmospheric Administration have seen their employees commit to saving the decades of invaluable climate data crucial to formulating climate policies around the world. His complete reversal of his predecessor's policies threatens to derail the progress the United States has made to reduce its impact on the planet. The recently-concluded presidency of Barack Obama succeeded in taking steps towards reducing the country's carbon impact. The U.S. Energy Information Administration reported a 12 percent decrease in carbon dioxide emissions in 2015 from 2005 levels. The largest emissions reductions during the ten-year period occurred within the industrial and residential sectors, which collectively release a third of the United States's greenhouse gas emissions. Obama's tenure also oversaw the country commit to clean, renewable energy sources. He also pushed for the Clean Power Plan, which requires individual states to meet a cap on carbon dioxide pollution released from their respective power plants. The United States's stronger stance against climate change played a major role in global efforts gaining ground in recent years. Its commitment, together with China, was the strongest factor that finally led to the creation of the Paris Agreement in 2015. This event was lauded as a breakthrough by climate advocates worldwide after several years of global climate negotiations under the United Nations Framework Convention on Climate Change (UNFCCC). In a speech at a climate conference in 2009, Obama recognized the threat of climate change to all nations, regardless of its contribution to the global carbon emissions. "The security and stability of each nation and all peoples--our prosperity, our health, and our safety--are in jeopardy. And the time we have to reverse this tide is running out," he remarked. Unfortunately, his successor undoubtedly does not share the same perspective at a time when it needs to be. Despite its efforts to reduce its impact, the United States remains one of the world's biggest greenhouse gas emitters, emitting about 15 percent of the global carbon dioxide as of 2014. Trump's policies threaten to not only increase the country's emissions for political and financial gains, but disrupt international policies aiming to adopt strategies for sustainable development. His plan to remove his country's participation to the Paris Agreement and cut off funding for UN climate programs may cause a significant blow to future climate talks and initiatives by other nations. In a world increasingly affected by climate change, ignorance and denial cannot be the new status quo. The progress achieved by scientists, policymakers, and advocates after decades of intense negotiations cannot be erased from public consciousness; rather, it should be propagated. If Trump's policies were not challenged and actively opposed, global warming may further accelerate to levels intolerable for any life on Earth. His alternate facts may lead to an alternate future no one wants to see.